Hello and Welcome to my blog! In this series I will detail the process of building sliding bypass doors, known as shoji, of western red cedar. Having detailed the making of shoji in the recent past, this series will highlight the challenges I’ve faced as I progress through this particular build, in addition to detailing much of the shoji making process. These shoji will stand nearly 8′ tall, making them quite large for shoji which are normally just shy of 6′ tall in classical Japanese architecture. In classical Japanese architecture the space above the shoji doors is consumed by ranma, a grillwork which resides between the ceiling and the shoji. My client, however, wants floor to ceiling shoji, and I am happy to accommodate the request and any challenges it may bring. To compensate for the additional height some changes needed to be made to the structure, the primary change is in the addition of a kick panel. The kick panel allows an additional rail to strengthen the frame against racking which would otherwise occur in a large door when it is moved. To further compensate for the additional height, these shoji will be made with a slightly heavier frame, being so large the additional heft of this frame allows them to remain in proportion. The kick panel, which will also remain in proportion will be set slightly higher than that of classical shoji. I began the work by breaking down the stock from 10′ boards to form the stiles. It is exceptionally difficult to find true VG material over the length of that run, so efforts were made to straighten the grain of the best material that I could reasonably acquire, starting with 8/4 material and cutting along the grain to straighten it out. As I straightened this material, being long and also thin, I needed to bring the stile to the straight edge rather than the other way around. The weight of the straight edge would pull the stile flat which is counter productive when checking material. My conclusion was that I needed a better support system than my workbench for work of this size. The tail vise on my workbench works well with rigid material, but on material which is influenced by its support, the tail vise setup is far from ideal. Once the stiles were dimensioned, I prepared to cut their mortises. Shoji are unique in that the double mortises are made relatively deep. The overall depth of the stile is 1-3/8″ and the mortise is about 1-1/8″ deep. I’ve heard stories of the mortises being made so deep that the remaining material is thin enough to be translucent, and I can appreciate why those makers want that, the deeper the tenon, the stronger the connection. The mortise chisel that I rely on most heavily needed to be reworked for this application. As it arrived it had a slight bow to the back of it, not much but enough that it would cause the chisel to ride away from the mortise shoulder in the final chops. If I were to simply flatten the back it would remove the back hollow. Retaining the hollow allows everyday maintenance to be much easier. After flattening the back, I reground the hollow first by machine then by hand to ensure that the sides were even. Finally I blackened the hollow and then polished the back. The mortise chisel now works even better than it had previously. Western red cedar is quite the challenge for any chisel, let alone one setup in less than ideal form. Western red cedar is not recommended for projects requiring joinery, I proceeded anyways, but at each step I’ve needed to be very much on top of my sharpening. To shape the rails I started from 12″ wide billets and split out the necessary material. Splitting the material allowed me to straighten the grain ensuring that these would be strong and without runout. I’ve detailed the process of cutting out the tenons previously and so I did not do so this time around. The remaining material was ripped to size for kumiko, the kumiko I would need would be nearly 6′ tall. My planing setup is made for normal height shoji (under 6′ tall) and so I needed to prepare a special planing beam for the task of flattening and thicknessing the long kumiko needed for this set of shoji. My father had set aside a piece of oak I thought might be perfect for this application, and upon further investigating I found it was exactly that. The oak measures 12″ wide, 3″ thick and 6′ long. Long enough to support the kumiko and thin enough that it could still be accurately flattened without the same amount of effort as flattening a workbench. The first step was to remove the twist from the board’s bottom side. This work was simple enough, though tough on my planes until the original finish and embedded sanding grit were removed. The board was then flipped over and flattened on the face which would become the planing surface. This face needed to be made very precisely flat in order to provide an accurate support for the kumiko and whatever future projects it may support. After removing the bow from the surface, I then slowly removed the twist checking every few passes to ensure that I was making good progress. I used winding sticks to check my progress and a straight edge to ensure that I was not reapplying a bow to the board’s face. After flattening the board, I cut a planing stop. Previously I have dovetailed these in, I’m no longer doing so and instead opting to simply screw them in place. The reason being that if I dovetail them in, then I need make a new stop every time I surface the board, the old stop no longer fitting after the surface level has been reduced. This is quite a nuisance for an everyday tool such as a planing beam. For ease of edge jointing panels, such as those that will be featured on this shoji, I setup a board on the side of the planing beam. I’m happy that I was able to achieve a fine finish on this beam and restore the board’s character, having been hidden previously coarse sanding and a heavy finish in preparation for it’s previous life as a mantle. It is a work horse now, but at least it can show off a beautiful coloration. Finally I needed to cut the end flush, a step I performed first by Festool tracksaw, then finished by handsawing and then planing. The end grain was sealed in effort to minimize future checking, I don’t expect much as this beam had been in the barn for at least 8 years and above a fireplace for an unknown length of time prior to that. Kumiko of this length cannot be readily planed using a stop, they simply do not have enough strength to counter the compressive forces. Instead, I needed to put them in tension. To do so I mounted a block on the end of the board the block having brass screws piercing through it. The kumiko are pressed onto the screws which hold them in place as they are planed. The screws are shallow enough not to engage the plane blade, and they’re made of brass so that any accidental contact will do minimal damage to my blades. The nails hold the block in place and allow easy removal once the process is completed. I hope that you have enjoyed following along with my progress, and I look forward to your comments. Thanks for another great write-up, Brian. Where did you buy that nice hammer? Hi, both may be difficult to find if not impossible, one is by Kosaburo Hasagawa and the other by Hiroki. Which do you refer to? The one in the last picture. That one is by Hiroki, you might contact Teshiba Masanori of Mandaraya Shop, good chance he may have one. Excited to see how you tackle this project Brian. It looks like a fun one. I’ve also tried the method of planing kumiko in tension. It seems like it is a versatile method, but I don’t have a hikouki kanna so I never pursued it too far. I’ll be interested to hear how it works out for you. Thanks Jon! I haven’t been using the hikouki dai at all really, just planing to a line. I found the hikouki tough to work with since I work from rough stock which can be inconsistent for a few shavings. That makes sense. I could see using the hikouki kanna for the final pass or two just to get everything very even in thickness. Good stuff! Please advise us in the FB group, when you post a new installment. 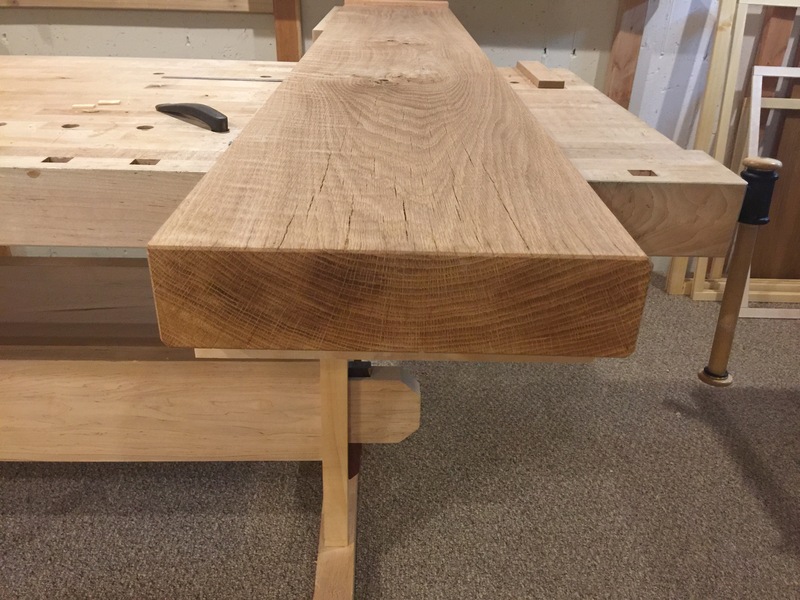 Very nice planing beam Brian and great write up on the process. I admit that I am a little jealous. I bet that piece of oak will prove to be quite stable. It’s not every day you get access to such a piece of timber. The shoji will be quite something. You’ll get lots of sharpening practice trying to stay out in front of that cedar. Good luck. Thanks Greg! I appreciate the comment, and I feel the same way about this piece of oak. I assumed little real flattening had been done to it previously, it was probably sent through a planer then sanded, so I took the minor twist set into it and assumed it was likely there from day one and probably hasn’t moved much. Nice to have access to truly seasoned wood from time to time. Thanks, I hope it turns out well and yes absolutely it’s providing as much time sharpening as one could want, I spend 1.5-2hrs per night just lining up plane blades and working them over. Hi Brian, can you elaborate a little on why WRC isn’t ideal for joinery. I know it’s a very soft material but used extensively by housewrights in this country. It’s not my favourite timber at all as I get an adverse reaction to it, breathing difficulties and excessive itchiness for several days. The only use I’ve found for this timber is for light duty work. Hi Salko, I should amend that and state that it is not advisable for visible joinery. The reason being is that it crushes so easily under the chisel, it’s really extremely difficult to cutout cleanly. This is my second major project with it, and I think that in any future projects I will replace it’s use with douglas fir. Only trouble is that I find old growth fir much harder to acquire. Yes I agree it does crush, my work around to that besides the obvious very sharp chisels I score a deep line using very light pressure with several light passes with a marking knife and go from there. Other than gasping for air like fish out of water using this method I’m able to get really clean joinery. Thanks Salko, I usually make knife marks around my joinery, it certainly helps. The trouble I commonly run into is that it will pull end grain along the inside of the shoulder, this typical for many woods but it’s excessive with WRC. I know you do Brian but I wanted to emphasise the depth of the line but as for end grain I too suffered much the same and cursed more times than I liked too. I still have a few boards left from a log I resawed a few years back. I really don’t have much use for it and so far I’ve used it to make some prototypes with it. But one thing I do like about WRC is that it takes a beautiful oil finish. Thanks Salko, I’ll aim for a deeper mark out and see how it works. I love how the wood looks, it’s beautiful old growth material. I agree it is beautiful, I hope it works out for you. Hi Brian, having come across some recycled WRC by way of a friend in short lengths of approx 100x100mm I had just enough to start a build on a portable workbench as it is nice and light but of a decent enough section for the legs. The mortices were quite…ordinary initially due to the crushing. I switched to using a guide block once close to the lines and paring across the grain with a 10mm chisel until a mm or so away then using a wider chisel to slice through for a consistent mortise. This was easier then expected in terms of control for me especially as with the small chisel it amounted to a stabbing motion. Hope it behaves itself for you, I found my sharpening skills were put to good use as well and this isn’t exactly a presentation piece I am working on. Nearly all of the joinery I have seen in Perth in WRC is machine done and does it get charged for ! Thanks for your comment! I may have to start doing the same for WRC, even taking the chisel out of the cut and giving it a quick tune up prior to cutting the shoulders still left them a little more ragged than I would prefer. It would seem, just as you found that they need to worked by paring chisel only at the last bit. I’m sure it does get charged for, I’ve needed to be very delicate with every part produced, so I would imagine the big shops take that into account with their pricing in addition to the material expenses and of course the machinery itself must be carefully maintained to cut WRC cleanly I would imagine. I will need to try Shogi making one day! Great work! I send you a pm on FB. Thank you for talking to So-san the other day!